Just the other day, I was in the backyard trying to square something up on the floor of the patio. Unfortunately, there wasn't an easy method for me to do this over the long distance. I ended up getting the task done by using a 5 point laser and plumbing down to get a reference point on the ground. Not the fastest solution, but problem solved. 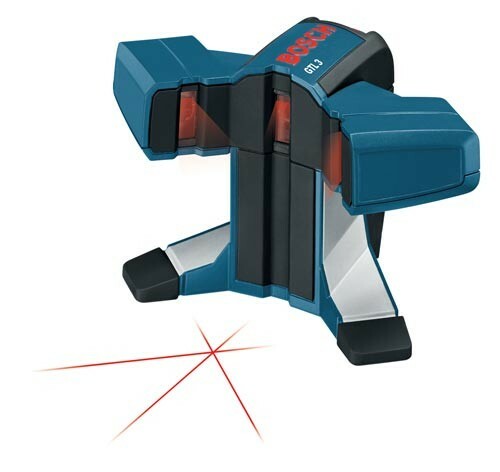 Then, just a couple days later Bosch comes out with a new laser that does exactly what I needed. Their new GTL3 Laser projects 3 lines on the ground to make a true 90-degree angle and a diagonal 45-degree angle. Now, not only can you check for square, but also diagonal alignments. Another great feature the GTL3 has over the competition is the fact that the 3 lasers all intersect at the start of the angle, which allows you to place the laser at the exact location you need. Bosch also raised the laser line higher off the floor to allow for more discrepancies in the evenness of your work surface. The new laser was designed with tile installers in mind, so Bosch made the GTL3 both water and dust resistant to keep the laser lasting, even in the unfriendly conditions of the jobsite. The GTL3 comes with everything you need to get started, including a canvas carrying case, a steel positioning plate, one laser target and four AA batteries. The GTL3 is not listed on Amazon yet, but ACME Tools has it for under $175.